US needs to spend more on developing energy weapons, or risk falling behind China and other rivals, a think tank has urged, telling the Pentagon to unify research efforts and even steal foreign technology to avoid falling behind. Published Tuesday by the Center for a New American Security, a think tank reportedly close to the current administration, a report titled ‘Directed-Energy Weapons: Promises and Prospects’ calls on the Department of Defense to drastically increase spending and unify research and development efforts for energy weapons. The report notes that by 2022, China could overtake the US in terms of total research and development spending. However, this might provide an opportunity “to adopt, learn from, or otherwise tap into foreign scientific and technical developments, as a way to truncate lengthy and cumbersome weapon development processes." “Directed-energy (DE) weapons, including high-energy lasers (HEL), high-power microwaves (HPM) and related radiofrequency technologies, offer the prospect of cost-effective precision attack or enhanced point defense and can provide warfighters with flexible non-kinetic employment options,” wrote Jason D. Ellis, a visiting senior fellow at CNAS. 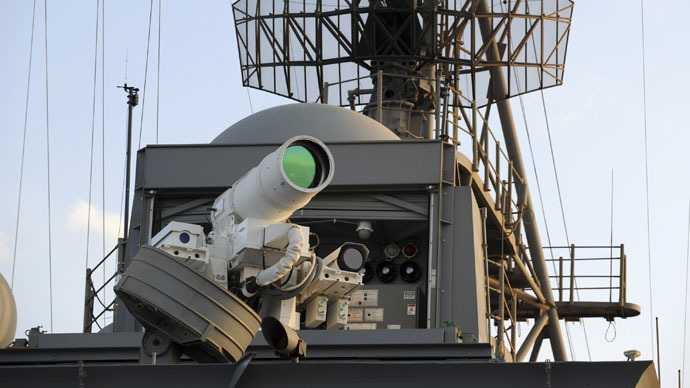 Currently, the US Navy operates a $40 million Laser Weapon System (LaWS), tested as a point-defense weapon against missiles, drones and boats. LaWS has been in use since August 2014, aboard the amphibious transport ship USS Ponce. Though energy weapons have a “history of overpromise and underperformance,” Ellis wrote, the systems currently in development show promise. They are “not yet game-changers,” though. Paul Scharre, the program’s director, noted that energy weapons held the promise of recapturing some of the technological advantages that have underwritten US military supremacy in the world. To accomplish this, however, the Pentagon would have to spend more. Currently the DOD has budgeted roughly $405.3 million for DE weapons, just 36 percent of the 2007 spending (adjusted for inflation). According to Ellis, “If DOD is to field operationally meaningful DE weapons, it should increase spending by two to three times for HEL and by five to 10 times for HPM,” or roughly half of the spending levels at the end of the Cold War.